TGIF everyone! What a great week we had at Sugar Fix! We had a busy opening to the week going non-stop taking care of restoring patient smiles with Cerec. 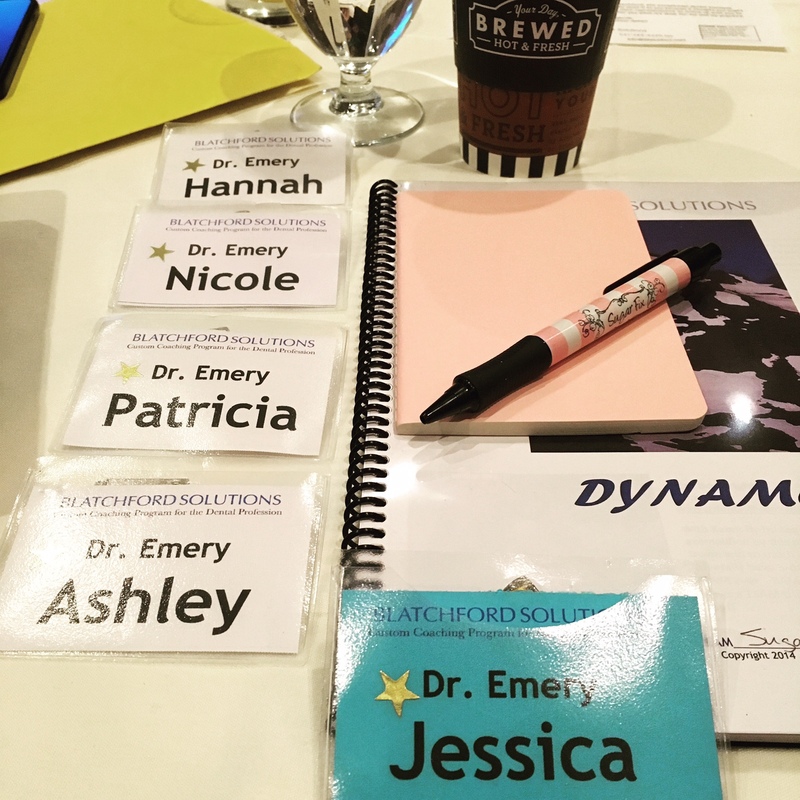 Thursday Dr. Emery & Team Sugar Fix joined other dentists and their teams at a continuing education 2-day seminar called, “Blatchford Dyanmo.” This is an intensive 2-day course where various aspects of owning a dental practice are discussed. Name tags from the Blatchford seminar that Team Sugar Fix attended. Dr. Blatchford & his daughter Christina have coached dentists throughout the world. An interesting aspect is that Blatchford Solutions only accepts 50 dentists to work with, so it’s a pretty exclusive group of top-level dentists that Dr. Emery is in the company of. Dr. Emery hired a new dental team member. Her name is Nicole Schilling and we are THRILLED to have her join our team! She brings great past experience to The Loft combined with a genuine passion for patient happiness & comfort. See if you can spot her in photos on any of our social media outlets in the days to come! Lauri, who is Dr.Emery’s Creative Director, has been busy getting Dr. Emery’s next campaign ready. Our current campaign is the gold 2016 team picture which was so much fun to create & execute, but this next campaign is a real favorite of Dr. Emery. She LOVES the month of February; Valentine’s Day, all things love, hearts, happiness, etc. Keep an eye out for our new ads on EL platforms this month! We’d LOVE for you to send us a selfie on Facebook, Twitter, Google +, and Instagram of you in front of our new campaign!! Next week we start our week off with our monthly 4×4 meeting along with our next book club book. Stay tuned for our book review sometime in the month of February. Then fully packed days seeing patients the rest of the week.